China has been besieged with growth slowdown resulting from its credit-fuelled stimulus programmes and property price bubble in years 2010 to 2011, consequently dragging on to 2012 to the current year, not to mention being impacted by the European crisis. The situation has prompted a number of domestic and multinational producers into either shifting to Plan B mode or in extreme case, idling their plants. The country, which has risen to becoming a strong manufacturing and consumer base fortress, grappled with a three-year low 7.6% slump in the second quarter of the previous year and a GDP growth that consequently slowed to below 8% in 2012. At the seminar on Market Overview & Progressive Technologies in the Plastics Industry held 18 March in Bangkok, Thailand, in conjunction with the Chinaplas 2013 exhibition to run on May 19-23 in Guangzhou, China, Stanley Chu, Chairperson of the Hongkong-headquartered Adsale Group - a major China trade promotion specialist and organiser of the Chinaplas exhibition - described the Chinese plastics industry during the 2012 slowdown period as still leading in the global market. He said that in 2011, China had been the world’s top plastics machinery producer in terms of total quantity for consecutive 11 years, and this stature is maintained in 2012 in terms of quantity tops in plastics processing, machine and product manufacturing, product consumption, and resin production. 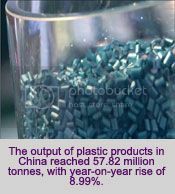 According to Chu, The output of plastic products in China reached 57.82 million tonnes, with year-on-year rise of 8.99%. 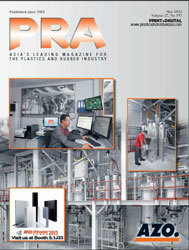 Accounting for the increased output were the plastic film ( 9.7 million tonnes),foamed plastic (1.72 million tonnes), plastic artificial leather and synthetic leather ( 3.14 million tonnes), and other plastic products; Whereas, output of plastic resin and polymer during the year was placed at 52.13 million tonnes, with year-on-year rise of 5.51%. Sales value of plastic products reached 1,645 billion yuan, with year-on-year increase of 15%. Meanwhile, per capita consumption of plastics in China was estimated at 46 kg in 2010, which was only one-third of that in the developed countries. On the other hand, the domestic plastic products industry will very likely to maintain the rapid growth momentum during the “12th Five-Year” period, said Chu. He furthered that plastics machine production in 2012 reached 270,388 sets to 7 % year-on-year decrement. Around 18% of China’s production output is for export. Last year, the country’s export of plastics products was valued at US$ 31.57 billion, with Year-on-Year rise of 34.5% and Import was valued at US$ 18.48 billion, with Year-on-Year fall of 0.42%. 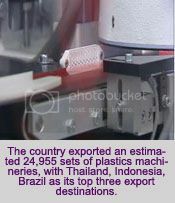 According to Chu’s presentation, the country exported an estimated 24,955 sets of plastics machineries, with Thailand, Indonesia, Brazil as its top three export destination. Currently, China focuses on seven important sectors for its industrial development, said Chu, mentioning to include energy saving, green technology, new materials, high-end manufacturing, electric vehicle, bio-technology, and merging of network, broadcasting, telephone and internet. Chu explained that the plastics industry in China is following technology trends that hinge on energy efficiency and savings, and high-efficiency. Moreover, the country seeks to produce environmental friendly bio materials that are light weight and processing that include high-end recycling and green processing. As for the plastics machinery sector, the country integrates technology applications across the industries, including automotive, building materials, electronics and electricals, agriculture, medical and packaging. Meanwhile, the country’s industry is putting in place the integration of more automated machinery to offset the raising labour cost, said Chu. 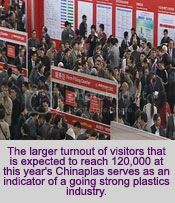 The upcoming Chinaplas show from 20-23 May in Guangzhou, with the participation of foreign and local manufacturers on a 60%-40% ratio, respectively, and 3,000 exhibitors; as well as the with a larger turnout of visitors than the previous editions, expected to reach 120,000, also served as indicators that the country’s plastics industry is nowhere near weakening, assured Chu.